This post was sponsored by the National Association of Landscape Professionals. All opinions and material are my own except as noted. Don’t get me wrong, I love being a physician. But sometimes I think I might be living a career with plants if I had known about them a few decades ago. Maybe some of you reading this will be inspired to consider your options to make a career with plants! For more information you can check out www.landscapeprofessionals.org and www.LandscapeIndustryCareers.org. For more about my own property landscape dreams, read on. Back when we lived in Oregon, I became fascinated by all of the gorgeous plants in the landscape. Hydrangeas, Japanese Maple trees, and bleeding hearts (Dicentra spectabilis) were a few of my favorites. I also loved the way people incorporated growing food in to their landscape. I started to re-imagine the home we were living in, which at the time had fairly bare-bones landscaping. There were three tiers on the property, so much to work with. I read carefully about which plants could go in what spots based mainly on the amount of light or lack thereof. I began to make sketches of my concepts and eventually took on the project of landscaping the whole property with my husband’s help. I learned so much in the process, and most of the plants there are still thriving (we sometimes drive by when we’re in town). Hydrangeas come in so many colors, like this deep purple. They adorn the landscape all around western Oregon. When we moved to Southern California, I realized many of the plants I’d fallen in low with in Oregon wouldn’t thrive here. As much as I would have loved a Japanese Maple tree in our front yard, the climate just wasn’t suitable. 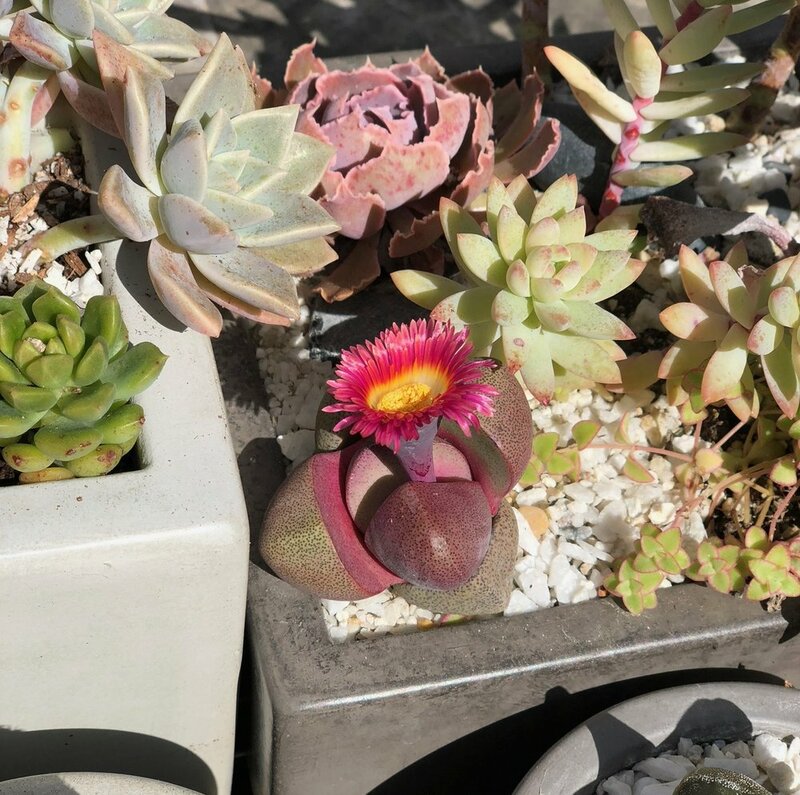 I quickly dove in to learning about succulents and eventually came across the term xeriscaping. This was about a decade ago. I started admiring the way many of the outdoor spaces around us were able to create so much beauty with succulents and other native species. Eventually we minimized the grass between the sidewalk and the street and planted succulents amidst decomposed granite. I used lots of potted succulents to decorate around the home and add pops of color. I still enjoy making potted succulent mixes for our patio. I especially love when they bloom! 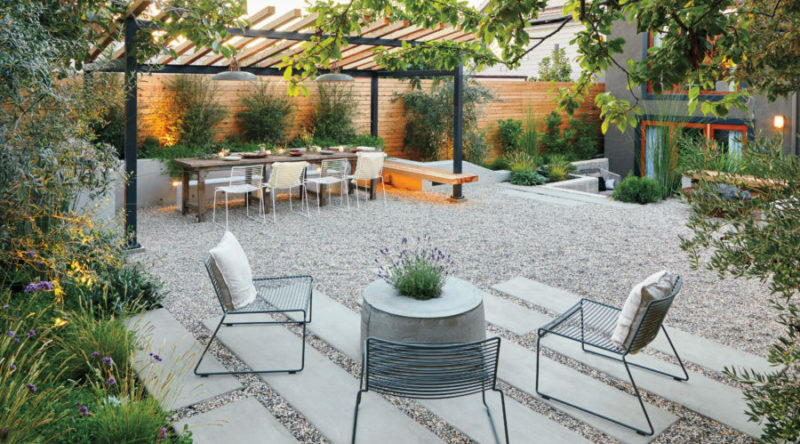 A couple of moves later and now we’re obsessed with midcentury style, including landscaping. 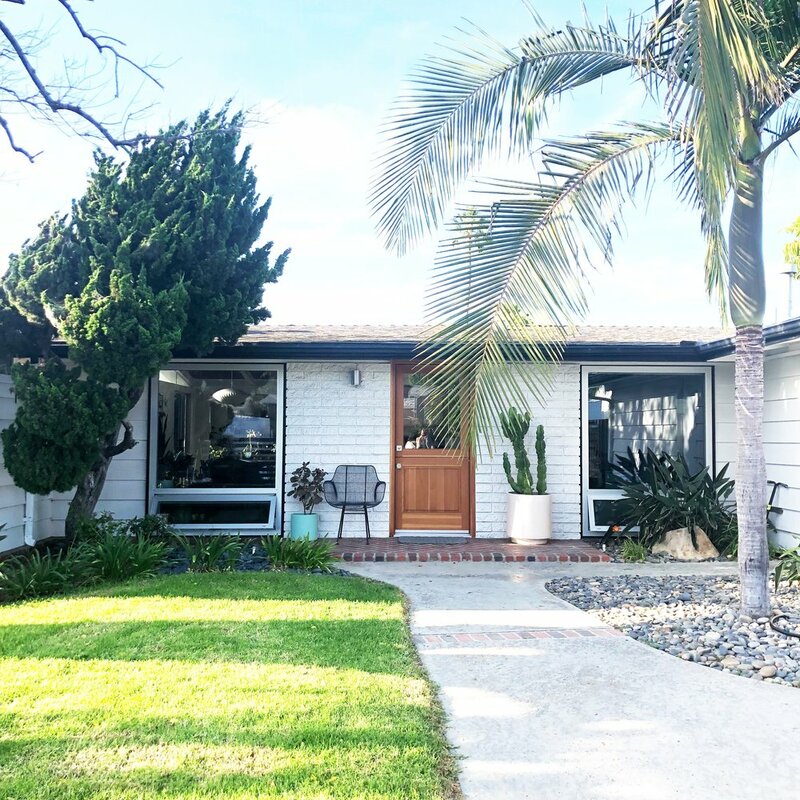 We were fortunate to find a little midcentury cottage that fit our aesthetic well. Our current front yard space. 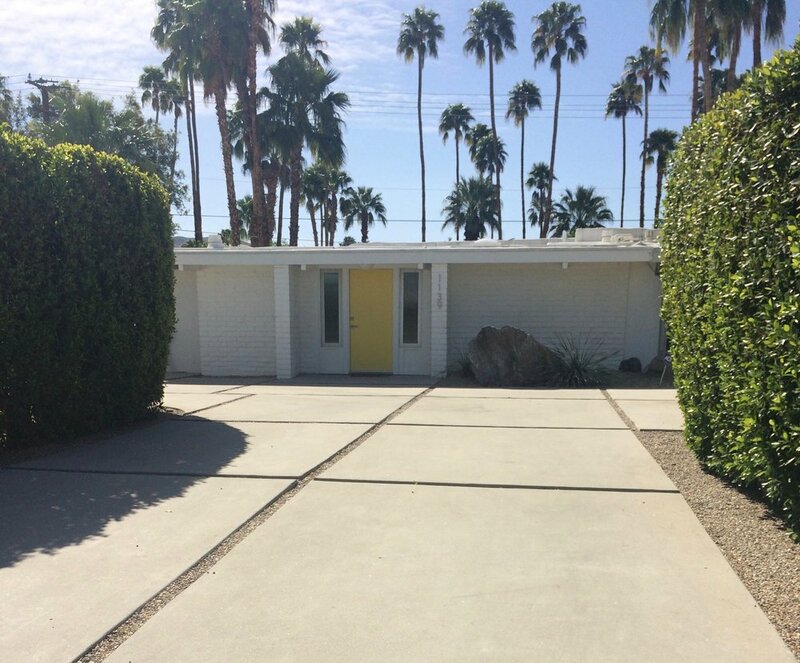 I took this photo of a home in Palm Springs during a recent visit. Saving as inspiration for our future landscape project. I don’t have to go further than our neighborhood park to be inspired by landscaping and smart use of water. Our park uses native species, a gray water system for irritation, and also has a basin to filter water before it goes to the ocean. A detention basin, designed to capture runoff and treat it before it reaches the ocean. Another photo I took in Palm Springs for landscape inspiration. Photo used with permission by Caitlin Atkinson www.caitlinatkinson.net / IG @mscaitlinatkinson. Project Design by Beth Mullins of Growsgreen http://www.growsgreen.com /IG @bethgrowsgreen. Someday we’ll hire landscape professionals to make our own property dreams come true! Until then I’ll keep finding inspiration from all of the amazing landscaping I’m lucky enough to have all around me as well as a road trip to Palm Springs away. 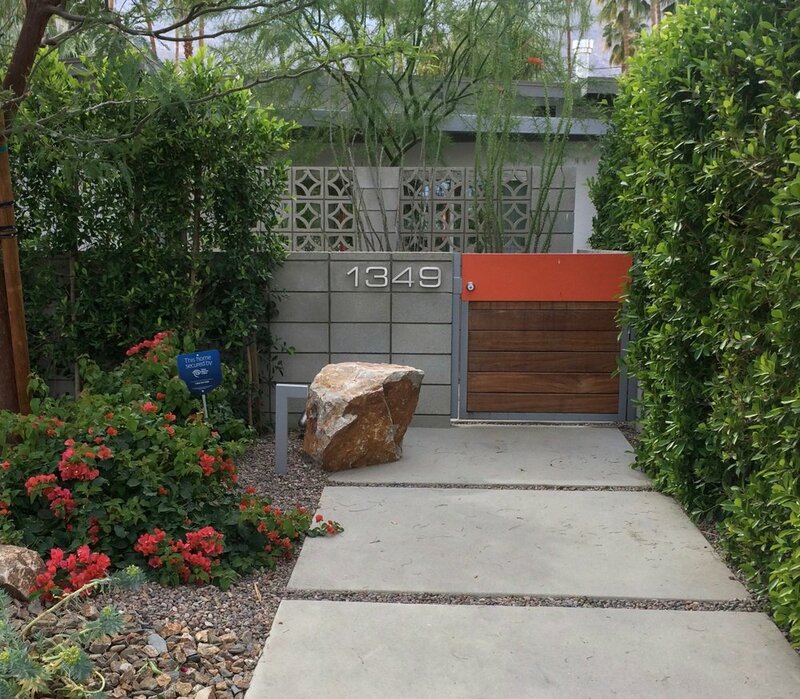 Another lovely Palm Springs home incorporating pavers, a boulder, greenery and a pop of color.